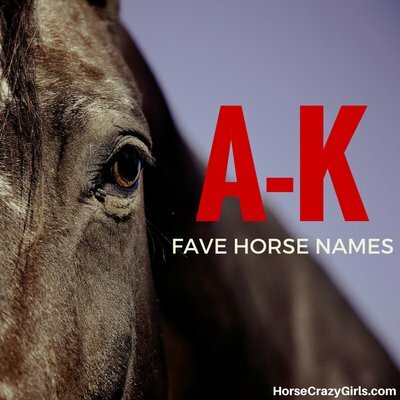 Share your favorite A-K horse names! So many girls have shared their fave horse names - and here are just some of them! Which ones do you like? Be sure to comment and share you own below! My friend Ayako is really important to me. Ayako is Japanese and knows Japanese. She told me the beautiful in Japanese is kirei. The horse I want is a gypsy vanor horse. These horses are beautiful so the name works out well. It's my favorite horse name because it is just super cute and unique! I think it is an awesome name for a dapple grey pony like mine and that is her show name we call her fancy for short she is amazing!!! Because it is so sweet for a foal that is as strong as a hero! Especially I like it for a chestnut foal. My chestnut foal on howrse is named that. I think this name would suit a gypsy vanner or friesians!! maybe even other fancy horses!! It is the name of a horse that i used to ride. She is a spunky and sassy paint that is so sweet. Because it just sounds so unique and it inspires me with the cheesy Dawson part and then gives it a bold look with Calypto!!! It means king of the stars. Because I know every horse wants freedom. Because my fave horse is called breeze. It’s a nice name for a horse. Dixie is my horse's name. It's short and simple yet it's a great name. P.S My horse's show name is THE DESERT LOVE! It looks normal... Try saying it together! If you did it right, it will sound like Who Farted! I named him that because when he was a little colt he used to buck around for the fun of it. Eilonwy is another of my favorite horse names. I actually did not invent that name; I got it from a weird but good book by Lloyd Alexander. I like this name because: #1 It's Irish #2 Because I love the story it comes from (which is set in Ireland). It's the Lara and the Moon colored filly series. Dannsair means: Dancer. It's a Gealic word and that is my favorite language. It describes the beautiful palomino you know. I love this name because it represents a town, which is Avanti, Italy. Its really beautiful to say, to! I have a pinto named Avanti. She is 9 years old named Avanti. She is 9 years old, and very young and beautiful. She can be a bit scared of her own shadow, though. Because it sounds like a fast, action-packed name for an Arabian! 'Cause I like roller coaster's and because horses have mood swings like a 'coaster and also because sometimes it can be a real coaster when you ride. Because she's brown and white and the brown is the Frosted Flakes and the white is the milk. That's my horse and he's been amazing to me. Hes taught me all i know in the western riding world. I was raised English so I love Dandy Boy for having patience with me! Cause it has a perfect tune when you say it. It is a unique name. My friend owns a Hanoverian and his name is Insomniatic. The definition is restless because of a constant enjoyable happening. Huggy is my horse because she so soft and cuddly and she was my first ever horse and she always loves a good hug from me or my friends! I like the name "Dreams", because it is a pretty name. I love the name Galileo because it was the name of my horse that past away recently. He was a Coal Black thoroughbred that I show jumped. My favourite name is Bella because that’s the name of my pony. I like the name Dare to Dream because it’s like Dream Come True but I think more creative and it sounds cool and pretty. It also easily shortens to "Dare" or "Dream". I also like Secret Keeper, Flicker, Second Chance, Keyhole, Mystery, Red Dawn, Dark Star, Black Magic, Daydream, Eclipse, and Firefly. Hope this was helpful. My favorite horse name is Mint Condition, which also happens to be the name of my horse. It fits her perfectly, and I think it is such a pretty name too. I had a Gypsy Vanner and her name was Opie. Don't know why, just found it cute and short. I always thought that was a gorgeous name or even Gypsy-Rose. My horse's name is Bananas. Because she is a tan and a dark brown mane. It somehow suited her. Also was 8 years old when I named her. I think Everlie is a good name because it is fun and unique. I like the name Mystic for a dapple grey mare because it hints at a more complex and mysterious personality for your horse. To answer a year old question, Shelby is a company that customizes Mustang cars. I have a horse named Sister. It suits her somehow. I think Blue Fire would be a good name for a blue roan, probably a spirited one, I love blue roans! I don't have a horse but these are a few of my favorite names! My horse's nickname because his name is Buck and he smells like coffee, even after a bath. I don't know why. I love that name, it is so cute and I want my next horse to be called that. My horse name is Cinnamon and I also love that name! I love this name because it's beautiful once you know what it means. It means " Shining Rose ". I would call a red roan or chestnut or white horse this. I love horses. I love riding them and they are so pretty and graceful. My best ride ever was when I rode my favorite pony at my barn, Fritz. I like it because it sounds beautiful. This is my favorite horse in the world! Because Fantasy is like dream and Anastasia it's like Fresh water in the forest. It is my horse name. Because that was the name of my first horse. I love the name Connie because in Jigsaw, Mawdasley that is the name of fave horse. I got it off a horse for adoption and he's really cute. Because these are the names of my horse and my sister's horse and I think they are pretty names. I don't know why, it's just a cool name. Because I think it is cool. When I think of this name, I think of a horse at my grandmother's house. The 'Pony' is a miniature horse and she has very light blue eyes like her dalmatian's. It's an awesome name for a very calm and loving mare or filly. Although it must be calm, it must still have a little spark in it! I think they are good names because those were horses I rode in my home state and they are amazing. Delila, Cobalt, Dime, Garnet. Saddle Club rocks! These are all the names of horses I've checked. It's my chestnut Arabian horse name. I love him to bits! Because I love black horses and Belle is a good name for a black horse. It's so cute for a dun stallion, I think it would be lovely. Also, you could have a nickname called Boo. Because it means a beautiful young girl and I love that movie! Because he looks like his Uncle Bo and he was like born in a storm. The reason why I like the name Flicka for a horse or a pony is because it means beautiful girl in some kind of language. I just love this name I don't know why. I named my friend's chestnut stallion Dynamite and the name suits him. My dogs name is Blizzard and I just love the name. I think the name Blizzard would nicely fit for a pure grey stallion or gelding. She is a lot of fun to play with or ride with because she is my baby. Those are all my horse names. I love the name Clestal because it's a majestic name, Clestal. Because I have a part share horse called that and he is really sweet, cute and fun to ride. Because his colour is copper and because it is cute. Also, because his nickname is after Bart from the Simpsons. I really don't know why I like the name- I guess it's kinda pretty. My horse is called Dolly Daydream because she always daydream when she is in the stable. It's the name of the gelding I ride. He's so sweet and his face just reminds me of a Fed Ex. Because my horse is called Angel and in every show I go to I always use her and she always comes 1st or second. Because when you dream you always believe. Bunny if it's a mare because it sounds cute, it can be any color! Eight Belles is one of my favorite horse names. It was the name of the black filly who took second place in the 2008 Kentucky Derby. Because if I get a black horse ebony means black and it is so cute. Because I've always thought of having a real house with the color of buttercups. Because Pat Perelli's sister's horse's name is Alure and he is so bubbly and nice and last pretty. It is the name of my horse who is the biggest horse at my barn and he is awesome and is super cute. Because it's the name of my pony and she is really cute. Your horse can ace whatever you want it to do that's why I named my horse that! Also my horse has an 'A' sort of shape on her fetlock that is also why. I like the names Amazing Grace, Cadell and Eat My Dust. Cadell means "war" in Welsh. I also like the name Kit Kat. I think Jewelles is a great horse name because it is well easy to think about and absolute great for a chestnut as my friend has name their horse Jewelles. I like the name Gemma because you can make lots of names out of it like Gem which is also a nice name but best of all of the names would be Gemma. I am a Saddle Club fanatic! Because my horse's name is that but I have a problem I don't have a show name. Because its my horse's name and I think it sounds very creative. It's best on paints because it looks like someone drew or painted their patches. I like the name Chestnut because it is a good name for a chestnut horse. I like the name Hollywood because it is a cool name for a horse. Because there is a horse named Gonnet on my favorite show The Saddle Club. Because it sounds like a sweet name. Because it is a really pretty name and you could call it Big-D.
My horse is an Arabian wild. I like this name because it makes me so happy that a horse can have another chance. I like this name because to me it means that a horse can jump good and well. That's why I like that name. I like the name Bramble because my horse eats bramble. Sometimes I get a bit worried about him but he is fine. From the massive horse lover ever/Bethany. Because it means pretty girl. Because I used to ride a horse called Champeon. Because my horse Blaze has a big blaze on his head that's why we called him Blaze. Because a paint has patches and that makes it perfect for the name Appachey. For an Arab its the best name ever. I think beauty is a beautiful name for a brown horse with white legs. That is my horse's name. Because it's my favorite thing. It is a very spontaneous name to me. Its unique, with a nice ring to it. Because its my horse's name! It's soft, sweet, cute, adorable, and callable. Because it is just, well, Belle! It sounds beautiful. I think it would work for a black horse. Because I own a horse named Dante and I think the name is unique! Because we think alike and he acts like he understands me! Because my old horse was called Bluebell but one day someone let her out of her stable and sadly she got run over. Because I have a horse called Dandy too and I love the name. Dandy is the name of my horse and it inspires me to have a look all the time. It is my first horse. Coriander In memory of a rodeo horse killed when it was hit by a bull. A famous Thoroughbred rode by Pippa Funnel. Ima Classy star for a paint.a name of a real horse. Because all horses are angels. It is the name of a talking horse belonging to a princess in the fairy tale 'The Goose Girl' by the Grim Brothers. Because he is a charming boy. Because I like the name and it fits my horse. She's beautiful but causes misery. Because Black Magic is my horse. He's a Jet black friesian stallion and my friend named him that before he gave him to me. Because that is my horse's name. My horse's name is Hope and she is the kind of horse that doesn't give up. She gives me hope everyday! Because that is the name of my goat tying horse and it means "goat" in Spanish and it is just flat out awesome! Bell is my favourite horse name because it sounds like a horse name and not like a human name and it doesn't sound boring. I love this name because it is is my horse's name and sounds beautiful! I love the name Jumpster because I did ride a pony named Jumpster but now it is hard for me to see him because I have to play rep soccer. This is my horse's name and it differed! Who would love a frisky horse. It was the name of my horse. This is my horse's name (her registered name is C Me Show Off) and I love her so much because she does so much for me. Cute and sounds like a palomino. Every horse I've been around seems like a dream or just not possible, so I think Fable would fit any horse! Lovely name for a show horse. I have just always loved the name. I don't know why though? This is my fave name because it makes the horse sound like he is interesting and funny. I think it is the perfect name for a horse with a sweet disposition. It is so lovely and darling. It sounds like a tough, strong name for just about any breed of horse, male or female. It goes best with chestnut or palomino. I like this name because it's uncommon and fits almost any horse/pony colour and also its my horse's name! If you have a horse here's a silly name. Because he has a great shot at being a winner. It has a nice and classy touch to it. Because it is a cute name. Because I use to take riding lessons on her. Aero just sounds so powerful and yet at the same time sounds so peaceful. Because it is the name of my favorite horse. Because it's different and I have a horse named Hercules! I knew a horse once at a horse camp and he was just a one of a kind amazing horse. He felt like a wonderful companion. Bo-bo is my fave horse name because I own her since she was born. I owned her mother now I own her. Because he's really cute, he's chestnut (my favourite colour) and he is really well behaved. Dazzle is a pretty name and it reminds me of a wild beautiful mustang and it goes good with a blue roan. Because it's weird and unusual. Of course a person could always call a horse named Feather River, River. Because this horse is very spunky and active and loves to dance with you. I think of a fast black horse. Because I like Appaloosas and I just think Apple will be a cute name for an Appaloosa. I don't really know, just like it! I love that movie and it has a western flare. The reason why I like this horse name is because it could fit any horse. It's easy to remember, it's a nice name and it's easy to write down on a peace of paper. It makes me think of love and friendship that is what a horse and rider should be like! Because that's what I'm going to call my new horse. I like the name Diversified Reble because it shows a spirit that can't be easily broken. Because he is my baby and he was born in a paddock in the country and he was trained in barrels and he won every competition he was entered in! Because Buddy is a lovely way to say a horse is truly your best friend! Because it's colorful and cute for a grey pony or horse. I like these names because in a way they are sort of mysterious, different, odd, amusing, cute, funny and hilarious all at the same time. I have a two year old horse named Charlie and he's such a beauty. Because that is my favorite name! I think Crestie is such a nice name. I always ride a horse called Crestie, he's my baby. It is original and also the name of my horse! I love this name for a horse. I think it sounds really wild and pretty. If I ever get a horse, I think that's what I'll name it! I love this name because it is an Indian name. It sound so pretty when you say it. Caspian is a really cool name for a horse! Because it's my horse name. It's a great movie and I really love it and that name. Because if your horse is giddy and won't stand still its kinda like he's dancing. I love the name Charm because its my horse's name and she is very beautiful and has a great personality. She is a heck of a horse and she does have a lot. He lost his mommy and I decided to call him Amigo for he has very strong will power and a very good appetite. He is already my best friend (Amigo). Don't know how I came across it but it's beautiful. I have a herd of minis & love them all! Fancy (black/shire paint mare), Jewell (blue roan), Gracie (gray mare). Hot Rod is the first horse I got. I got him when he was only 3 years old. The name is just perfect for a temperamental horse like him. Because it's true and I love the name. I think it is an adorable girls name. Always keeping it interesting! Just because I like the name for a white horse and I like the song Old Blue Jeans by Hannah Montana. I love this name because its the one thing for everything. It matches any horse. I think Brownie is the ultimate name for a brown/black coloured horse or pony. Brownie is also my fave horses name. I like it because it is like a powerful name and it is very cool. That's my horses name and i love the Dallas Cowboys! It's a real horse name! It is my leased horse's name. He is an amazing jumper and he is really, really cute. I love him so much. It's just so majestic and beautiful. Constantine can be a male or a female name. Constantine was a Roman god that brought Christianity to the Romans. It rhymes with my name (Molly) and it is my pony's name but her real name is Ashdene Holly II. She is a New Forest Pony and she is only 4 yrs old! Cherokee is my favourite horse name because it was the name of the first horse I rode on. Also it sounds really cool! It sounds so sweet! I have an Australian pony called Apple. She's so perfect! Electra is my Arabian mare. She is 18 this year. Epic was a Fjord pony stallion at my old barn. I think he is 10 this year. I like this name because Kaplanz is original. Because he is my favorite horse in the world! He can jump a 1.20m. I think Jigsaw would really suit a Pinto or a Patchy horse - it would look just like a Jigsaw! Because that was my old horse's name that died and that was also my first horse. Because they are all so tasty and sweet! I used to have a mare named China but she was really old so we sold her. Because my favorite pregnant mare is named that. I had a dog named Ginger and she was my fave dog and i think it would be a really good name for a horse. Because my dream horse's name was Goldie, but she got sold. She was a beautiful Palomino Quarter Horse mare, and the first horse that ever nuzzled me! All horses are so nice. They are always nice in the heart. If they are wild at times well that is natural. When a horse saves someone they are like an angel. Bertie because he his my pony now and the other because it's my older horse. It's a sweet name that has a nice sound to it. It sounds cozy and friendly. It's my palomino's name and he aced the test of winning my heart! I don't get it-does Shelby mean anything? Like a mustang-y name?